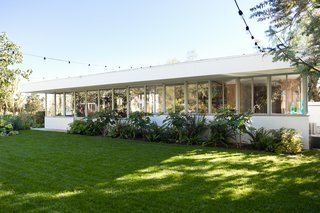 Designed by architect Raphael Soriano, this lovingly restored Historic-Cultural Monument in Los Angeles is seeking a new owner. 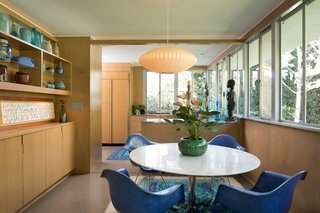 Designed in 1940 by Raphael Soriano, a noted architect who interned under Richard Neutra, the Lukens House takes its name from client Glen Lukens, a ceramicist, USC professor, and cofounder of Arts and Architecture Magazine. The International-style home features a flat roof, overhanging eaves, a smooth stucco exterior, and a ribbon-like band of steel-framed windows. 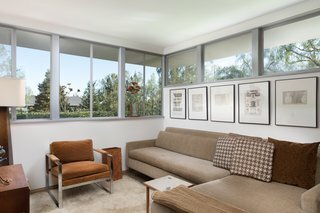 Comprising three bedrooms and two bathrooms, and 1,491-square-feet of living space, the home is located on a nearly half-acre lot in L.A.’s Jefferson Park neighborhood, and surrounded by lush landscaping. 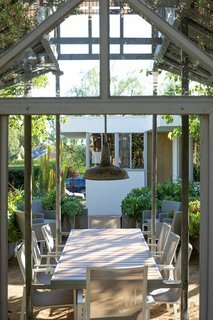 The residence also comes accompanied by a 1908 glass greenhouse that has been restored and repurposed as a dining pavilion. Set back from the street, the International-style home features deep, overhanging eaves and a band of clerestory windows that wraps around the entire home. The Lukens House narrowly missed demolition—it had fallen into severe disrepair and was deemed a "nuisance property" and slated to be destroyed in 2006, according to the Los Angeles Conservancy. 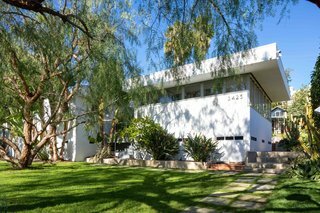 Luckily, the Conservancy’s Modern Committee and West Adams Heritage Association stepped in to designate the dwelling a Los Angeles Historic-Cultural Monument in 2007. The owner, Mike Chapman—who also happens to be the listing agent—purchased the property in 2010 and painstakingly restored the house and gardens, referencing original drawings and historic photographs in the process. 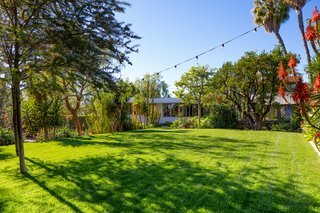 As a result, the Lukens House earned "more awards for preservation than any home in California from organizations such as the Los Angeles Conservancy, California Preservation Foundation, and the Los Angeles Business Council," Chapman tells us. 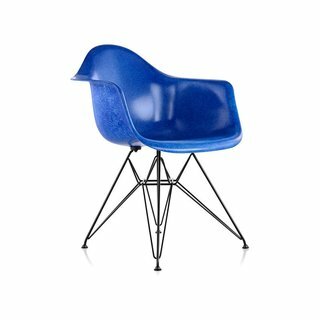 Soriano experimented with different building materials such as steel, glass, plywood, and cork. 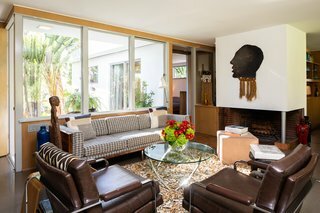 The renovation referenced original drawings and historic photographs, and was sensitive to the home's original design. 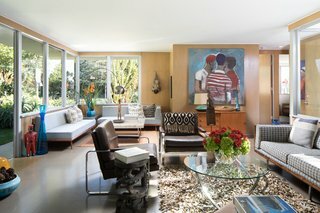 The living room once featured built-in cabinets and a sofa, similar to the current configuration. The dining room now occupies the space that was once the kitchen. The renovation opened up walls and added a credenza for serving. Originally, Lukens had requested lots of shelving for his ceramics. 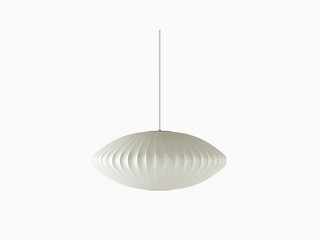 First introduced in 1952, the George Nelson Bubble Lamps by Herman Miller are definitively midcentury modern, and they're so iconic that they are part of the permanent collection of the Museum of Modern Art in New York. 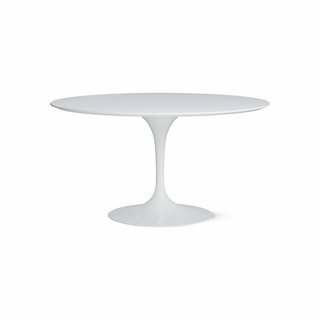 When Eero Saarinen was designing his Pedestal Collection in the 1950s, he promised to find an alternative to the constricting undersides of tables and chairs at the time. Barry Milofsky of M2A, Milofsky & Michali Architects designed the kitchen cabinetry to follow Soriano's style. He even included a recessed drawer pull that was specially-designed by Soriano for the Lukens House. 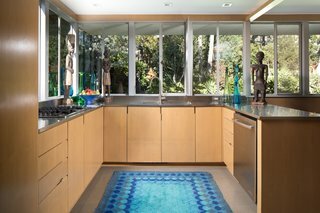 The stainless-steel countertops are similar to ones Richard Neutra, Soriano's teacher, used in many of the homes he designed. What had been Lukens’ bedroom now functions as a sitting room. The minimalist exterior is defined by the flat roof, overhanging eaves, a and ribbon-like band of glass windows. The home sits on a 0.44-acre lot in downtown Los Angeles, sited within the grounds of the Lyndsay Mansion’s garden. Soriano removed only four trees from the property. In fact, a 1908 tangerine tree still produces a stellar crop every year. The 1908 greenhouse from the Lyndsay Mansion has been repurposed into a dining pavilion. 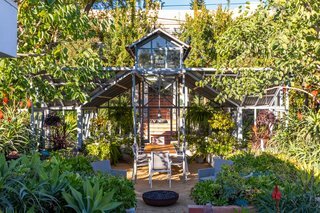 During the restoration, it was revealed that Soriano had perfectly arranged the home to line up with the original greenhouse. The repurposed and restored open-air dining pavilion provides guests with a lush backdrop.